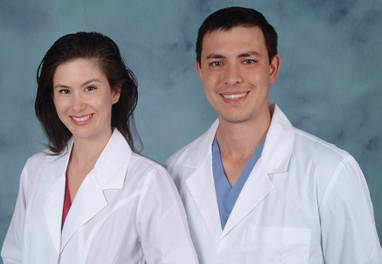 Dr. Roger West and Dr. Vanessa West are committed to providing excellence in dentistry, and each stands out as a leading dentist in Thousand Oaks. They use the latest in dentistry techniques to provide you with a beautiful and healthy smile. Additionally, Dr. Roger West and Dr. Vanessa West believe strongly in education to prevent oral health problems before they occur, and makes sure to keep patients fully informed about their dental health. Dr. Roger West was born and raised in South Pasadena, CA. He received his D.D.S. degree from the University of the Pacific School of Dentistry in San Francisco in 2002. Prior to dental school, Dr. West graduated with a B.S. from Brigham Young University in 1999. He enjoys all aspects of dentistry and has extensive experience and training in implant and cosmetic dentistry, oral surgery, and working with children. He has completed training in implant dentistry at the Zimmer Institute in Carlsbad, CA. He has also furthered his education through his study and involvement at the Dawson Academy, one of leading institutes for continuing dental education in occlusion and esthetic dentistry. He is an active member of the Santa Barbara- Ventura County Dental Society, California Dental Association, and American Dental Association. He is also a member of the San Gabriel Valley Periodontic Study Club. He and his wife Vanessa are the parents of three children. He enjoys spending time with his family, playing basketball, and speaking Mandarin. Dr. Roger volunteers as a manager for his son's minor's little league team in Thousand Oaks. Dr. Vanessa West was born and raised in Honolulu, HI. She received her D.D.S. degree from the University of Washington in 2003 and a B.S. in Nutritional Science from Pepperdine University in 1998. Dr. West is one of a few dentists worldwide certified in the revolutionary pinhole gum surgery technique to correct gum recession. She completed a mini-residency in prenatal and pediatric dentistry in 2011. Dr. Vanessa has extensive experience working with children and finds joy in helping them establish good oral hygiene habits. In all aspects of general and cosmetic dentistry, she is very thorough and strives for perfection in all that she does. She enjoys traveling, eating sushi, gardening, and spending time with her family. Dr. Vanessa West volunteers at Lang Ranch Elementary as the Gifted and Talented Education coordinator and Math League coach. She also teaches the 8-11 year olds at her church Sunday School.